A bow press is necessary to determine whether you have mechanical wheel lean and to effect correction. The advent of the compound bow changed archery for the better. The addition of wheels allows more people to participate in our sport by making it easier to draw and hold heavier draw weights. Higher let-off at the back end of the draw cycle makes it easier to aim and hold on target longer. Wheels also provide a lot more arrow speed than traditional bows are capable of at the same draw weight. So it’s ironic the very thing that gives compound bows all of their advantages can also rob you of perfect arrow flight and accuracy. With the addition of wheels, cams or pulleys comes the additional costs of wheel timing and wheel lean. Many archers are now familiar with wheel-timing issues. If your bow’s wheels are not synchronized perfectly, they fire out of sync, causing the arrow to whip at release and fly horribly. Not many people are familiar with wheel lean, however. 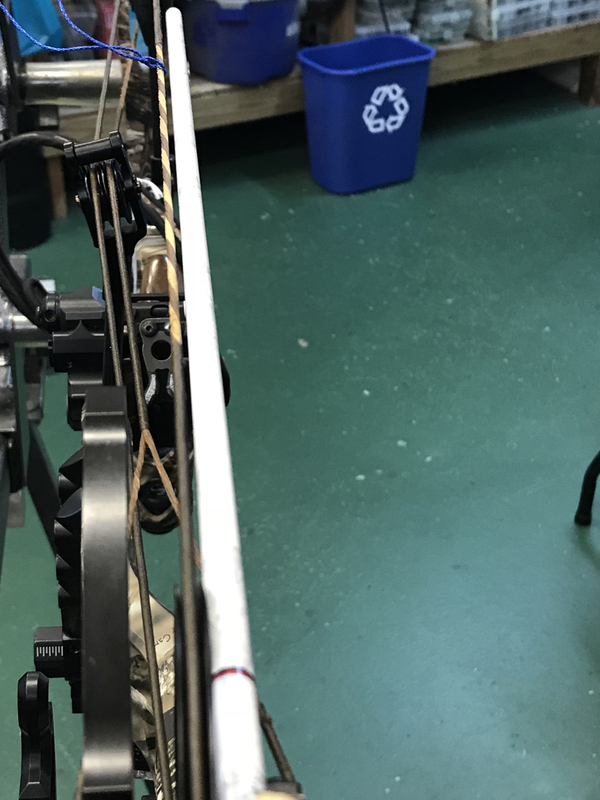 This can be as big — or an even bigger problem — as wheel lean not only drastically affects arrow flight, but it can also cause excessive wear to many parts of your bow. There are two types of wheel lean: Mechanical wheel lean and shooter-induced wheel lean. Inherent wheel lean is caused by one or more of several mechanical issues that can occur. Shooter-induced wheel lean is caused by improper sight alignment and/or improper shooting form. Either way, accuracy is drastically affected, and not for the better. Check wheel alignment with an arrow shaft. In cases of mechanical wheel lean, severe damage to both the string set and bearings (both wheel and cable roller) can occur. In the case of shooter-induced wheel lean, the arrow impacts the target horizontally out of line with the bullseye. The groupings of arrows will drift progressively in the direction of lean of the bow’s top wheel, becoming more severe as distance increases. A common cause of mechanical wheel lean is unaddressed string and cable stretch. All modern compound bows use either a cable rod with a slide or rollers to pull the cables out of line and provide clearance for the arrow’s fletching as it passes them. This creates uneven pressure on the limb tips, which causes severe wheel lean. In order to correct this, one side of the yoke or harness is often twisted more than the other to compensate. As the bow is shot repeatedly, this stretches, along with the rest of the string set, allowing the cam or wheel to lean again. This is corrected by adding additional twists as necessary to bring the wheel back in line. Sometimes, the limb itself becomes warped, and the yoke is not able to be twisted enough to level the wheel. This requires a new limb to fix the issue. On split limb bows, the four limbs have to be synchronized to the same strength or deflection. A good analogy for this is that of fishing rod actions: If the left limb is medium-fast action, and the right limb is medium-heavy action, the left limb will bend more than the right limb, causing the wheel on that end of the bow to lean. There are several ways to correct this issue, depending on the cam system. They include twisting the yoke, swapping limb position and changing wheel spacing to affect wheel alignment. Twisting the yoke works the same as with a solid-limb bow. 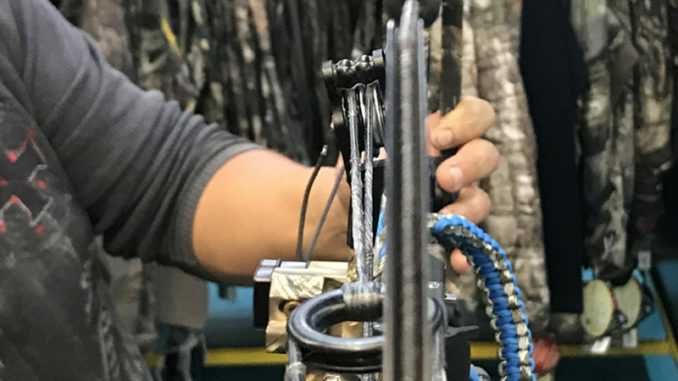 In rare cases, swapping limb position will help, but the best system is a top-hat limb bushing system such as that used by Mathews on the Halon, Triax and several other models. By changing the top-hat bushings, wheel lean is easily and perfectly corrected. In instances of severe mechanical wheel lean, it is not hard to diagnose, but in many cases, a well-trained eye is required. In nearly every case, a bow press is required to correct the problem. For these reasons, it is best to have your bow examined by a professional. Further complicating diagnosis in some of the newer models, it is necessary to have some pre-shot wheel lean in order for the cams or wheels to be straight in-line at full draw. On most single cam models, the idle wheel (top wheel) must be aligned straight when the bow is at rest. This is easily checked by placing a straight edge — an arrow shaft works best — on the shelf (outboard) side of the wheel. The gap between the arrow’s shaft and the bow’s string should be even for the entire length of the arrow. Dual cam and cam-a-half systems are harder to judge. Shooter-induced wheel lean is often caused by improper leveling of the bow sight’s second and third axis adjustments. Many archers are not even aware of these features, but if improperly adjusted, will cause the shooter to lean the bow at full draw. Also, poor shooting form can cause this problem. Have your bow sight’s second and third axis checked by a pro shop to prevent this issue. If your issue is form, working with an instructor for an hour or two should correct it. Although wheel lean causes many issues for the archer, it can be corrected fairly easily. A quick trip to your local pro shop can diagnose and fix this issue, often without breaking the bank. So don’t let wheel lean rob your accuracy and cost you a buck this season. 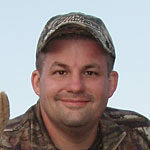 Sammy Romano is a lifelong hunter who has worked in the archery industry for more than 24 years. His expertise includes compounds and crossbows.